New Delhi: Mukesh Ambani’s Reliance Industries Ltd (RIL), in filings before the Supreme Court on Tuesday, challenged the Bombay high court verdict in the ongoing gas dispute and at the same time introduced fresh evidence that seeks to undermine claims made by estranged younger brother Anil Ambani’s Reliance Natural Resources Ltd (RNRL). 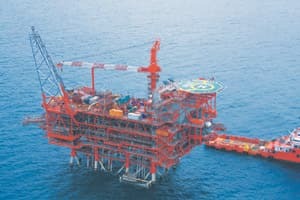 New turn: An RIL platform in the KG basin. The Mukesh Ambani-controlled company has sought to strike at the very basis of RNRL’s claims that it needs an assured supply of gas for its proposed power projects. These submissions have been made ahead of the Supreme Court taking up the case on 20 October for hearing in the dispute over the supply of gas from RIL’s D6 block in the Krishna-Godavari (KG) basin. RIL and RNRL had approached the Supreme Court against the verdict of the Bombay high court on 15 June, which had asked RIL and RNRL to sign a “suitable arrangement" for the supply of gas. RIL is appealing the judgement while RNRL wants it expedited. The Supreme Court refused to stay the Bombay court’s ruling. RIL in its reply to the special leave petition filed by RNRL stated that if RNRL’s demand for gas at the below market price of $2.34 per mmBtu was approved, “the government would lose large sums of money in profit sharing, royalties and taxes." It also refuted the recent media campaign by the Reliance-Anil Dhirubhai Ambani Group (R-Adag) which alleged that RIL would make a windfall profit of Rs50,000 crore at the cost of the government and the consumer. It clarified that under the production-sharing contract, the government, and not RIL, would receive a progressively higher profit share to the extent of 85%. It also questioned the RNRL stand of seeking a major share of the KG D6 gas despite the fact that it had not built a single power plant since the scheme of demerger in 2005 and that the government had allotted gas to existing priority customers who have operating plants to utilize the gas. While a spokesperson of R-Adag declined comment, an external spokesperson of RIL did not respond to Mint’s query at press time. RIL has submitted before the apex court certain documents such as minutes of its board meeting conducted in 2005 and an application from an R-Adag firm to the ministry of petroleum and natural gas holding the gas supply master agreement as a valid and legally binding document, contrary to its stand in Bombay high court. RIL stated that these documents could not be produced earlier. While the Bombay high court had relied upon the board meeting of 18 June 2005 to show that the MoU was binding in nature, the minutes of the RIL board meetings, which were submitted to the Supreme Court, held thereafter show that the MoU was never placed before the board of directors and approved by them. While RNRL has sought the apex court’s intervention in a special leave petition for immediate supply of 28 mscmd of gas from KG D6 at $2.34 per mmBtu for a period of 17 years, RIL, in its affidavit, has opposed this, saying the price is 44% lower than that mandated by the government and that it cannot supply gas at a price not approved by the government and to a user not listed in its gas utilization policy. Further, the reply states that at the time of listing of global depository receipts on the Luxembourg Stock Exchange in August 2006, RNRL had claimed it would sell gas to its affiliated power companies at prevailing market prices, contrary to the impression it gave in its petition to the apex court that it would be supplied to consumers at a lower price. In a related development, RNRL on Tuesday filed some additional documents in the apex court alleging that director general of hydrocarbons V.K. Sibal had approved capital expenditure exceeding Rs40,000 crore in exchange for undue favours from RIL. Sibal questioned the move by the Central Vigilance Commission for a “discreet field verification" of allegations against him, saying no new charges can be entertained against an official six months prior to the extension of his term. The allegations, he said, were to “blackmail" CVC into denying him an extension.